KaiserSlots casino offers over 400 mobile slots with a sleek and elegant design! A recent addition to UK shores, KaiserSlots casino looks like it has what it takes to take one of the largest markets in online gambling by storm. It has hundreds of games presented on a sleek platform that looks easy to navigate and has a strong brand identity. Much of this assumption is correct. However, there is more to a mobile casino than just the look of it and when you inspect KaiserSlots a little more closely, you realise it falls far short of what you would expect from a casino of this calibre. While not a terrible casino by any means, there is definitely a lot of room for improvement. If you want all the best and current slot titles under one roof, KaiserSlots is definitely going to appeal to you. With 400+ games, this site is nothing to sniff at by any means. If you want to access some of the best games on the market, then KaiserSlots is the best place to start, especially if you're a player that's new to mobile gambling. On the other hand, if you're a veteran player, you might want a bit more from a website than just games. Sure, we can all log into a casino and play slots, but what accompanies those slots and what makes the experience as a whole fulfilling? In the case of KaiserSlots, we're sad to say, not an awful lot other than performance. We've mentioned quite a few times already, but KaiserSlots has a large amount of games. With over 400 slots, scratchcards and live casino games to choose from, boredom is never an issue at this casino. Each game type is divided neatly into its own category and from among its ranks you will find the likes of top developers like NetEnt and Microgaming. All the games are easily playable on mobile as well as desktop and make use of an effective, sleek platform that can be accessed easily for all those devices. You can play the games in either demo mode or full on playable mode once you have signed up to KaiserSlots and put down your first deposit. Like we said, it's great for new mobile players to use this site as they can experience all these great games all at once without having to try different sites. However, there are sites that offer much larger quantities of games and a much wider range of content to choose from. Let's talk about KaiserSlots and its promotion schemes. In short, they're rather limited. Not absent, per se, but definitely not as big as they should be. The most significant of them is the welcome bonus: a £100 deposit match, plus 10 free spins. This wouldn't be anywhere near as underwhelming if the casino offered other things alongside this. A weekly bonus scheme, perhaps or even a Refer A Friend scheme. Most unfortunately, this potential has been squandered by either a lack of foresight or incredibly lazy developers. Offering such an underwhelming welcome bonus and only offering more to VIP users is more than a little exclusionary and doesn't do much to make players want to remain on the site. This section is going to be rather short, because the only other promotion schemes worth mentioning at all at KaiserSlots is the VIP exclusives, which exist for players that have an added membership. While you get a monthly cashback, only offering it to VIP members isn't what you would call accommodating and it disappoints us how KaiserSlots could be so short-sighted. Payment at KaiserSlots is varied, but can get complicated. For example, you have many different forms of depositing. This can be anything from VISA debit cards to wire bank transfer. Neteller and Skrill-1 tap are available as well as mobile deposit methods such as Zimpler. Depositing is simple enough, but withdrawal gets confusing. At least, the policy is confusing. It takes between three to five days for a withdrawal to process with a limit of up to 7,000 euros a month. A minimum of £10 can be withdrawn and the same goes for the deposit limit. Customer service at KaiserSlots is pretty good. There's a live chat function, and there's a support email ([email protected]) to contact as well as a phone number (02033189367). Different points of contact is always good for a mobile casino and, thankfully, KaiserSlots nails it. Want to play at KaiserSlots? KaiserSlots offers over 400 games for players to enjoy! Claim 100 extra spins now! KaiserSlots KaiserSlots, overall, is a pretty competent casino. It fares well on a multitude of devices and provides plenty of games to play. This makes it a good choice for beginning players to sign up and test the waters before joining a more sophisticated casino with a broader selection. However, its lack of decent promotions and underwhelming approach to offering more than it currently offers leaves much to be desired. This might change overtime, but for now KaiserSlots isn't something we rate in its entirety. Jackpot Strike Mobile Casino Review — Deposit £20, Play with £100! 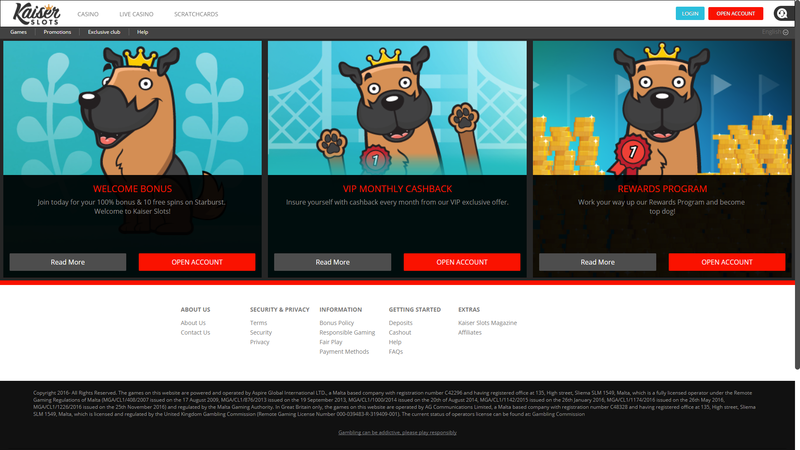 Pots Of Luck Mobile Casino Review — £500 Welcome Bonus!